[invite] Bianca: A whole cafe dedicated to the delightful peanut spread? Shiver me timbers!! When I got wind of this recent opening late last year the excitement was very real! Peanut Butter Bar opened at the end of 2017 with a focus on healthy and not so healthy treats. I’m going to be honest, I was sceptical at first. Healthy Peanut butter based treats? Protein pancakes? I was concerned! In my house, we’re staunch Pics fans, so much so, it’s normal for my mum to pick up 4 jars at a time when they’re on special. Here they use LA-based Buff Bake, a high protein, natural nut butter brand. As well as Skippys, slightly saltier but equally delicious. 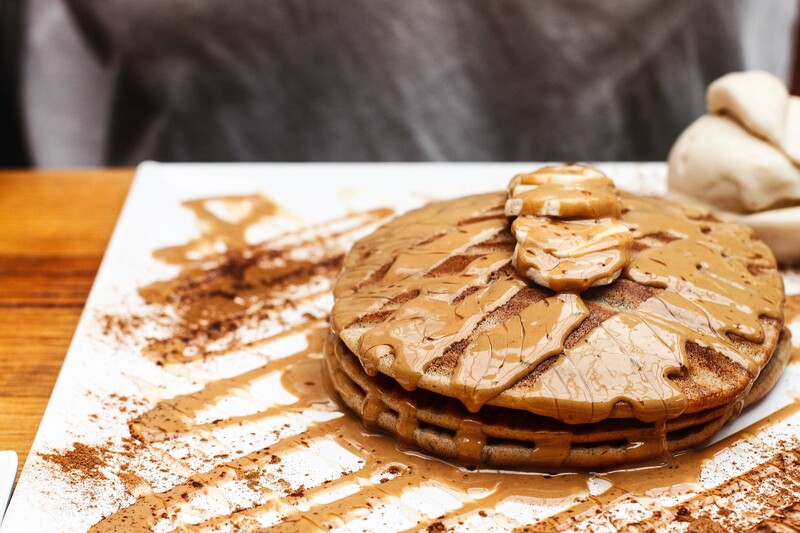 There’s something for everyone, cheat cakes, healthy cakes, vegan cakes, high protein ice-cream, high protein pancakes. The most difficult decision you’ll make is what to order. Of course, I was going to order the pancakes… The Peanut Butter Banana protein pancakes -w/protein gelato $16.50. Deespite my initial reservations, this was one of our favourites. The pancakes were light and fluffy, with slices of banana between each pancake. The protein gelato was a great addition to add some creaminess. And the melted peanut butter on the side allows you to control just how much of a ‘peanut’ hit you’d like. The Red Velvet Brownie -w/ protein gelato $16.50 was a stand-out for Alex. Served piping hot, scoop gloriously into the unctuous gooey brownie and you’ll be rewarded with a sweet fluffy cake-like treat. I was far more taken with the Salted Peanut Butter & Choc Chip Cookie -w/protein gelato $16.50. Another favourite, I loved the varying textures. The warm crispy/soft cookie, lava-like melted peanut butter and the creaminess from the cold gelato. This ticked all the boxes for me and I could have easily continued to scoop at it. The Cakes fell a little flat for the three of us, we sampled the Peanut Butter Cheesecake $8.95 (pictured below) , the Vegan Berry Cashew Cheesecake $9.95 and the Peanut Butter and Ricotta Cake. Some very strong dishes here and quite a bit more we didn’t get around to trying. Indulgent Wellness is their tag-line and I respect their ethos that healthy food doesn’t have to be bland and boring. Providing you’re balancing your calorie intake with exercise there is no reason why you can’t indulge yourself. *For Food’s Sake dined as guests of Peanut Butter Bar. Next Mark + Vinny’s Spaghetti & Spritz Bar – Surry Hills. I went here when it first opened (as a peanut butter lover) but didn’t love the healthy stuff. The best stuff was the regular stuff with the liquid peanut butter!